Spring is upon us and with the change of the season comes our latest update to OneDesk! In this release our goal has been to improve Usability and as such we’ve highlighted a few changes that we would like you to know about. – Item Properties Panel. The item properties panel has been updated with a new, compact look. This means that you will not have to scroll the details panel as frequently to see the info you are looking for. The image below shows where you can find properties that have been re-positioned under Project Management items. – Improved Card View. A new design and layout for the status board card views in each section, as well as more responsive actions on drag-and-drop card movement. The status boards for items and containers have been updated, as well as the custom boards you have created. – Streamlined Filtering Interface. Filtering is a core feature of OneDesk, and we have simplified the filtering controls so that users can more easily create and save the filters they need. We’ll be rolling out changes to more UI elements soon, so if you have any comments or suggestions on changes you would like to see, let us know! – Export Current View Now available due to popular demand, you can export the current view to CSV. If there is a set of data you regularly need to export, this new feature is for you. 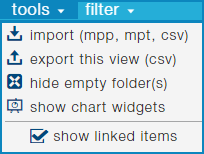 Simply set up the columns, sorting, and filters you want, and then click Tools > export this view (csv). If you save a filter for future use you can just click the filter tag, and export with a couple of clicks. This is a browser-dependent feature and has been tested in most popular configurations, but let us know if you have difficulties with your setup and we’ll be happy to assist. – Improved performance. In this release we have worked on improving the responsiveness of the client, as well as for some of the operations on items (like move, indent, create, etc.) There is more to come here. – 130+ bug fixes and enhancements. Have a comment, question or suggestion? Visit the OneDesk Portal and let us know!